Objective: To evaluate the results of arthroscopic treatment of various subtalar joint pathologies. 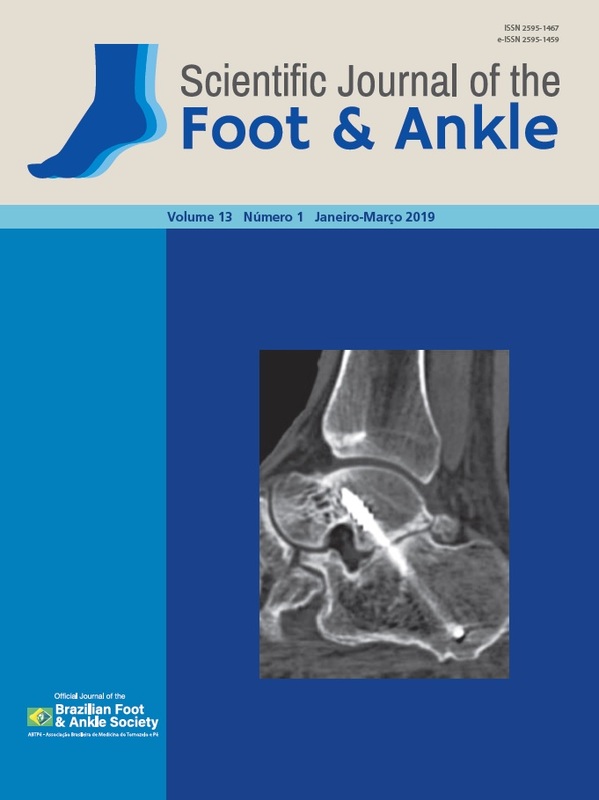 Methods: Retrospective study of patients undergoing arthroscopy of the subtalar joint from 2005 to 2013, totaling 10 cases over a mean follow-up of 27.1 months, in which the American Orthopedic Foot and Ankle Society (AOFAS) scale and pain visual analogue scale (VAS) scores before and after surgery were compared. Results: The preoperative AOFAS scores ranged from 35 to 74, with a mean score of 50.1 points, and the postoperative scores ranged from 82 to 100 points, with a mean score of 90.8 points. When comparing the scores, we observed an average gain of 40.1 points. The mean VAS score for the initial pain assessment was 6.5 points, and the mean postoperative score was 1.4 points. Conclusion: Arthroscopic treatment of the reported subtalar pathologies led to encouraging results, with a significant reduction of pain and improvement of functional status. Level of Evidence IV; Therapeutic Studies; Case Series.